We have been eagerly waiting for our new ducklings to arrive, we noticed the first one about midday today, then when we check at about 1:00 pm there was six of them, with one of them being only about 15 minutes old. I was having a meeting with Stephen from Geolocarta and we both went down and looked at the ducklings, there is something special about seeing something so newly born. One of the ducklings was still visibly wet so must have just appeared from within the egg so was probably only 15 minutes old. There was a total of 26 eggs, so we are hoping that we will get about 15 ducklings from this batch. Crystal and one of her first ducklings, with an egg. We were going to give some of these ducklings away, and sell some of the rest to a local produce place, but have decided that we will keep most of this batch, and give away the next batch. 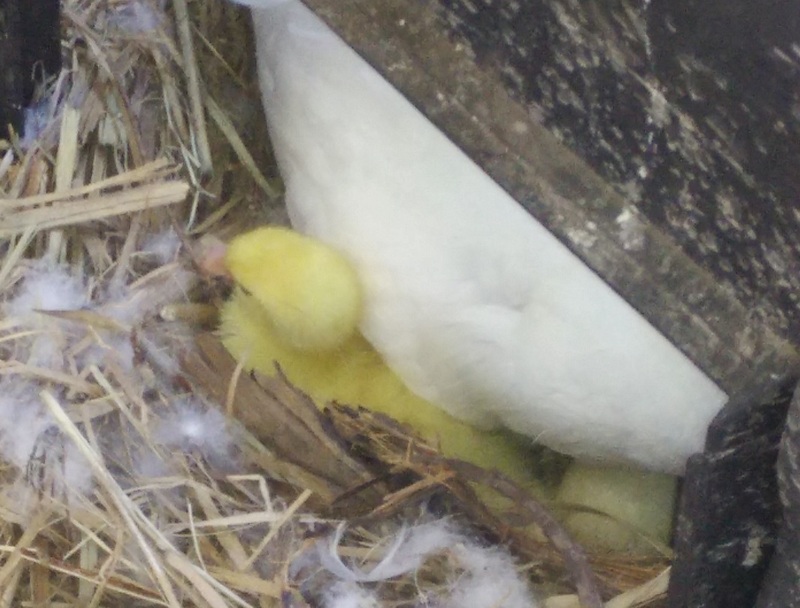 Crystal was a different genetics, as she was bought in as an adult so we can keep these ducklings and use them for breeding. Also Jo likes white ducks and since the mother is white, we are hoping that we will get many pure white ducklings from this batch, it appears that the duckling in the above photo will turn out to be pure white. Ducklings are yellow and/ or black when they are born, and as they get their second feathers, the black areas stay black, and the yellow areas become white. Looking forward to seeing how many ducklings we will end up with in total, we will know by mid afternoon Sunday, as all the ducklings will be born within a 24 hour period.